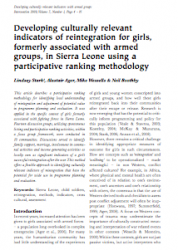 This article, published in Intervention, describes a participative ranking methodology for identifying local understanding of reintegration and adjustment of potential value in program planning and evaluation. It was applied in the context of girls formerly associated with fighting forces in Sierra Leone. Fourteen discussion groups, utilizing spontaneous listing and participative ranking activities, within a focus group framework, were conducted in 10 communities. Discussions served to identify family support, marriage, involvement in communal activities and income generating activities as locally seen indicators of a girl's successful reintegration after the war.